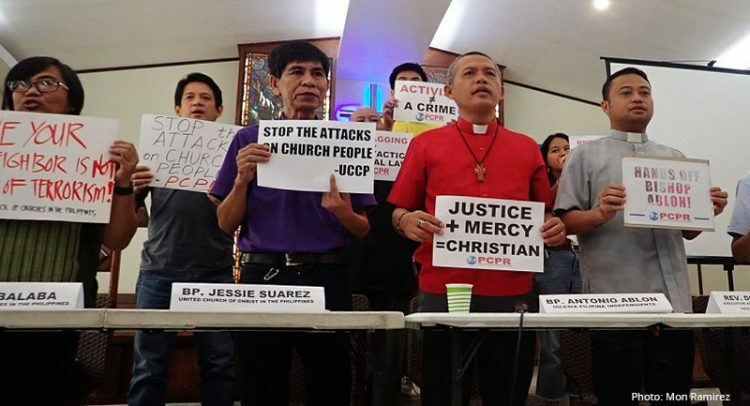 The National Council of Churches in the Philippines is gravely alarmed over the “red-tagging” and harassment of our member churches, the Iglesia Filipina Independiente (IFI), and the United Church of Christ in the Philippines (UCCP). We are also extremely worried that The Rt. Rev. Antonio Ablon, IFI Bishop of the Diocese of Pagadian, was singled out in this red-tagging. As Christians and followers of Jesus Christ, it is our duty to uphold justice and oppose all forms of oppression and exploitation in our country. Jesus’ statement is a “Good News” to the poor and bad news to the empire. When he challenged the status quo, according to Luke 4, ‘they’ drove Jesus out of the town and tried to hurl him off the cliff. This still rings true in our time today. These markings appeared after a series of mercy missions spearheaded by the IFI, in June 19-21 of this year in a militarized Lumad community in Zamboanga Del Sur. These missions included providing the community with basic needs such as food packs, including medical check-ups and psychosocial interventions as an expression of solidarity and service to the poor in the midst of crisis. Bishop Antonio Ablon, in one of his interviews maintained his prophetic stance to be of service to the people despite the numerous attacks on churches. “This (attacks) is aimed at silencing me for my continuing human rights and peace advocacy. The lumads, farmers are facing highly militarized conditions and I have been working together with other advocates to defend them and be their voices, but this will not stop me,” the bishop said. The widespread red-tagging, intimidation and harassment to church people is a direct attack not just to the church as an institution but to our mission as Christians. This latest harassment to our member churches and Bp. Ablon, is just one of the many reported cases of threats and harassment to our churches and churchworkers. We express our deep concern on the rampant threats, harassment, and persecution of human rights defenders, peace advocates and political dissenters. We call on the government to stop these attacks to all churches and organizations that uphold life and dignity for all. As prophets of our time, it is our mandate to: denounce the evil structures in our society that oppresses and exploits the poorest of the poor among us; to announce the ‘Good News’ of God’s reign – to proclaim release to the captives and recovery of sight to the blind, to let the oppressed go free, to proclaim the year of the Lord’s favor; and to become witnesses of God’s justice and peace on these challenging times. As people of faith, let us not be afraid in standing for what is just, but instead, let us join our hands together to continue to be in solidarity with our people, challenging the status quo, and siding with the most vulnerable and oppressed to advance the vision of Christ of abundant life for all.